I love a good tagine, it's basically a fancy stew with fruit and nuts in it and you can make one out of pretty much anything you have lying about as long as you've got the spices. I also love them because it means I can get my old faithful slow cooker out and if there's anything I enjoy more then cooking it's when I can get machines to do all the boring long bits for me without worrying that the house might burn down if I go out for a few hours. I've played about with this recipe over the years and it's ridiculously versatile depending on what you have available. One of the things slow cookers are really good at is taking the cheapest cuts of meat and turning them into the softest most delightful morsels to have ever crossed your tongue so, with that in mind, I have tried this with lamb and beef. Even meaty fish and prawns are excellent (although only put fish in for the last 10 mins and drop the fruit in favour for a good squeeze of lemon and some spinach). Alternatively you can make this winter vegetarian version by Sara, sans the 'stealth fruit'. Pop your slow cooker* on high so it gets warmed up and throw in the squash, onion, pepper, chickpeas, celery, apricots and salt and pepper. While that's getting started, heat a little oil in a pan over a medium low heat and add the garlic, harissa paste, cumin, paprika and turmeric. Stir over the heat for about 1-2 minutes to release all those delicious smells. Pour in the passata, adding a little water to the carton or tin to get out any of the tomatoey goodness stubbornly sticking to the sides and stir into the garlic spice mix. Bring the heat up a bit so it starts to simmer. Pop the skinless chicken thighs (if there's one thing that's not improved by a slow cooker, it's any kind of skin) in a bag with the seasoned flour (just white flour, salt and pepper) and give them a good shake so they get coated. Heat some more oil in a pan over a medium high heat and once its hot shake any excess flour off and lay the thighs in the pan. Seal them off for a few mins on both sides and add them to the slow cooker as well, submerging them in the vegetables. Add the coriander and leave on high with the lid on for about 4 hours, stirring occasionally. 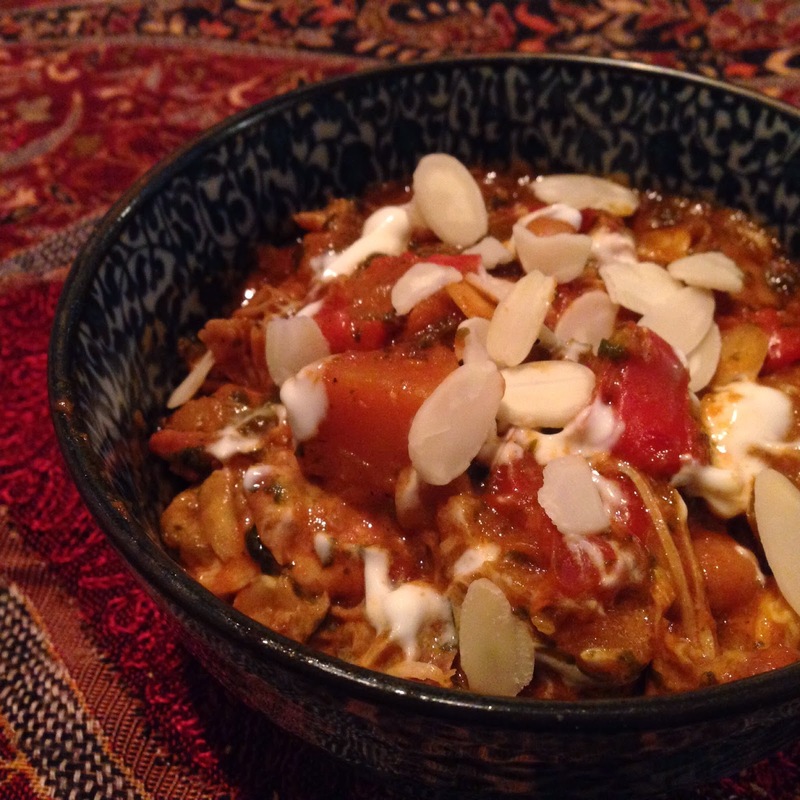 Once it's done, fish the chicken out and remove the bones from the thighs (so much easier doing it now than before or when you're actually eating it), spoon the tagine into bowls, add the chicken and garnish with a dollop of yogurt and a sprinkle of sliced almonds. Serve with rice, quinoa or it goes perfectly one of our chickpea flour pancakes - whatever you prefer! *Don't worry if you don't have a slow cooker, this can just as easily be done in a casserole dish with a lid in the oven. Just set the oven to approx 170C/325F/Gas Mark 3 and cook for half the time. Make sure to keep an eye on the liquid levels and stir occasionally. I made this today, minus the squash and using half the honey, and it was gorgeous! Will definitely make it again soon.